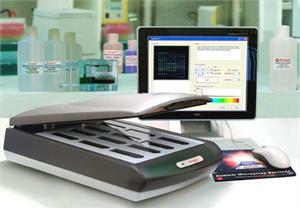 The SpotWare™ Colorimetric Microarray Scanner 220 volt overseas version opens up a whole new world of microarray technology. Complementing fluorescent scanning technology, our Colorimetric system allows researchers to use the full spectrum of pigmented labels including the products of horseradish peroxidase (HRP), alkaline phosphatase (AP), gold-silver developers, myriad secondary antibodies, and any other labeling system that produces a pigmented reaction precipitate. The Scanner accommodates the standard 25 x 76 microarray format, including glass substrates treated with silane reagents, coated with gel layers or white membranes, or colored glass.